I have been sharing the following with people these days. The above is similar to a lot of conversations I have been having with people lately. 1. That God’s will be done and the Lord protect the candidates in this election. 2. Pray for reconciliation through dialog between the Colombian and Venezuelan governments. Recently they have been heavily at each other with words. And to compound the problem, US drug planes have strayed into Venezuelan territory. We do not need another war. 3. May the Lord speak at my coming sharing at PAPA (People Against Poverty and Apathy) Fest, 6/19-6/22, and Cornerstone Festival, 7/1-7/5. 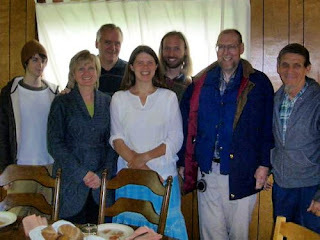 Here at Plow Creek, Heather and Paul Munn (3rd and 4th from the left) are starting a spiritual retreat ministry for the poor, people from the city in recovery from homelessness or addictions who cannot afford most retreat places. To their right are some people who are interested in the retreats and may provide referrals from the ministries they work with in Chicago. Boo Graham (not pictured), Rich Foss, and I are part of an advisory committee for the ministry. This picture was taken at the first trial run retreat. I was impressed with the potential for this service.